The village appeared on the archaeological map in 1905, when a mixed collection of bronze objects found much earlier in the Bryntêg area, was recognised as being an important find – now held and displayed in the National Museum of Wales as 'The Seven Sisters Hoard'. The name of the village derives from 1872 when local entrepreneur, Mr David Bevan, was having a pit sunk. At a ceremony to mark the occasion it was decided the pit should be known as ‘Seven Sisters’, after the seven sisters of his son Evan Evans Bevan. The pit prospered, and the village which developed around it became known as Seven Sisters. In its day Seven Sisters was typical of the Welsh anthracite coalfield; an example of 'industry within a rural setting', with many colliers working at both mine and smallholding. 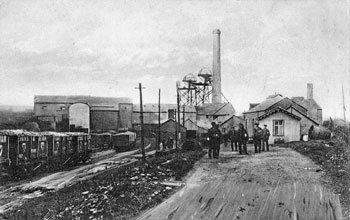 After employing a thousand men at its peak, and supporting local open-air baths, cinema, brass band, first-aid station and the like, it went the way of so many collieries with closure in 1963. On what was once the colliery site, we now see Canolfan sheltered houses and Ysticlau Park playing field. Marking the industrial past of this site is a pair of pithead sheaves, with preserved sections of railway lines—five pairs—indicating the size of that enterprise. Coal seams are still worked locally (as opencast sites), but the scale and character of industry and business is changing. Witness the recently opened Nant y Cafn golf driving range, marking a distinct shift from the colliery-based culture of the past.